Teens will compete to win a scholarship to a popular culinary arts program at the International Culinary Schools at The Art Institutes. The 13th annual Art Institutes Best Teen Chef Competition is open to high school seniors and recent graduates who are interested in becoming a chef. 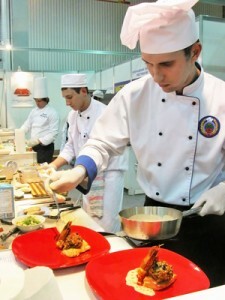 This is the first year that the competition for the culinary arts schools will host high school graduates in addition to high school seniors. First place prizes will be awarded to the best chef in each category. The best chef wins a tuition scholarship (worth $4000) and $1000 goes to the runner up in the high school seniors category. High school graduates that win the culinary arts school battles will win $1500 for placing first in their category. Eligible students and graduates must submit an Entry and Release Form by February 3rd of next year to the location where they wish to enter the competition and completed entries are due back to their culinary arts school of choice by February 24th. Students and graduates who are selected to compete in the competition will be call upon to progress to Cook-Off Competitions at their local International Culinary School location on April 21st.